Details on these Car Shows, Swap Meets, Cruise Nights, Toy Runs CLICK HERE! List your Oklahoma Car Shows, Toy Runs and Swap Meets for FREE on our website! - Email your car show flyers and detailed information to Route66CruisersOK@gmail.com Please include full typed details in the email as this will help your car related event stand out. Did we mention this is free! Sept 27th-28th 2019 Route 66 Cruisers 12th Annual Cruise Night and Car Show at Claremore Lake 2019! Tulsa Underground Tunnels Tour 2019 Pictures sent in by Jim White. April 17th A Spring Cruise to Prairie Grove Arkansas, trees are in bloom and they will eat over there. Meet up at Faith Baptist Church on HWY 88 heading to Inola at 8:30 am, then to Loves Truck Stop in Chouteau 9:00 am, then caravan to West Siloam Springs. You can also catch The Bill Holden Band on April 20th at the Moose Lodge 7th and Garnett Tulsa, OK from 7:30pm to 10:30pm. April 26th 5:00-?? Cruise In at Ne-Mar Center in Claremore. 4th Friday of the month. May 5th Club Meeting / Cookout at Oologah Lake 4:00 to eat - 5:00 to meet! Jim is going to be available to take photos of club members and their cars, for those that are interested in getting new photos posted on the website or Members Only Facebook page. More info will follow in the near future. We need a group of volunteers there around 2:30 or 3:00 to setup and and start cooking. Future meeting dates: June 2, July 7, August 4, Sept. 8, October 6, November 3, December - Christmas Party date to be announced. Pictures from March Cruise In taken by Jim White. Pictures taken by club member Jim White. Car Show Drone Video taken by Jimmy Ripley of Aztec locksmith & Oklahoma Aerial in Claremore. We are now non-profit & tax exempt 501 (c) (3)! Taken by Jimmy Ripley of OklahomaAerial.net & Azteclocksmith in Claremore. 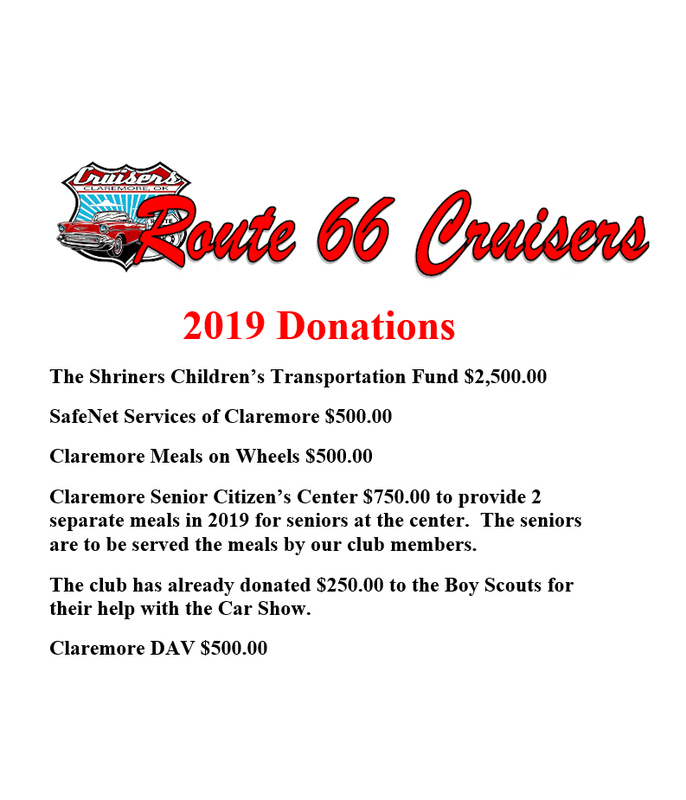 Charitable Donations 2019: The Route 66 Cruisers Car Club is pleased to announce our 2019 charitable donations! Proceeds from our car show & swap meet will benefit these great organizations.